One of the most important institutions in Burke was the School. The first Burke School was started shortly after the town was established on August 1, 1885 by order of County Judge J. T. Maroney upon application by Arthur Arrington, Berry T. McCarty, and S. J. Havard. Arrington was a well-known resident of Burke at the time, and McCarty was a son of pioneer settler Orange McCarty. S. J. Havard may have been S. James Havard, who was a Baptist minister in another part of Angelina County in 1880. The order indicated that the school had 81 students, a surprisingly large number for the time. By comparison Burke School had 88 pupils in 1960. The school must have drawn students from a large area and supports the reports that parents from other parts of the county boarded their children at Burke in order to attend the school. The School was initially known as "Bradley Prairie School Community, No 10" and was located at "Burke Station". Burke School preceded both Lufkin and Diboll schools, now the largest schools in Angelina County, by several years. front of the Burke School building. At one time Burke School had a full 12 grades, but some time before the 1950's it was reduced to 8 grades when the webmaster attended Burke School. To attend high school students were required to transfer to another school district. Diboll High School accepted Burke students with no tutition, and most Burke students attended Diboll High School. Bus routes ran both to Burke School and Diboll High School. Students in the northern part of the district were more closely allied to Lufkin Schools, and many of them, such as the author, attened Lufkin High School and were required to pay tuition. Burke School endured until it consolidated with Diboll Schools in 1964. 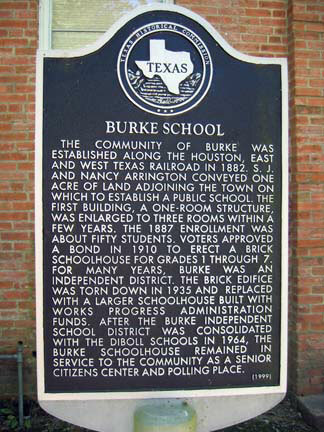 Texas Historical Commission Marker, "Burke School"